Best LED Grow Lights Reviews (2019) for Weed, Cannabis & Money | Top 10 Full Spectrum LED Grow Lights: Choosing a grow light for your grow room can be confusing if you are growing for the first time. Here we help you pick out from a selection of the best LED grow lights 2019 and even the full spectrum grow lights which would fit your budget and most importantly your requirements. There are a ton of options in the market and buying LED grow lights 2019 for your indoor growing room is a big investment. Here you can find anything that your indoor growing needs. Here we have made a combination of bestsellers, budget options, award winners, supplemental lights, lights for large grow rooms as well as small spaces, as well as the lights that are most prefered by the readers of 420 arena, growers just like you who are already using them in order to get the best results possible. There are a couple of factors that you need to take into consideration before choosing the best light for your grow room. In order to provide your plants with light, you will need a grow light which is powerful enough to cover the grow area where your plants are going to be. The area may differ depending upon the scale of your operation and if you have different space allotted for seedlings and clones or are you planning to grow your marijuana all the way to maturity in one place. Another thing you will need to decide is whether you want an all-purpose light or will you be planning on supplementing your plants with other lamps for processes such as vegetation and flowering. However, if you are tight on budget and are on the lookout for a lower running cost and a stealthy growing then LED grow lights are the perfect fit for your project. Last but not the least, you will not face problems such as running too hot, ballast or replacing bulbs. All these problems have been associated with the HPS and HID lights and not the LED lights. Let us further take a look at the best LED grow lights of 2019 and help you select the perfect grow light for your grow room. First and foremost, you need to be clear on how much area you want to cover with the grow lights. Keeping the area in mind, you will be able to choose on the number of LED lights you need and which types would be the best for you in terms of covering the area that you desire to get covered. If you are looking to cover a large space, multiple grow lights can be placed near one another in order to provide light to every petal of the plant. If you are looking to cover a full growth cycle, you should take a serious look at some of the full spectrum LED grow lights in order to help you with your growing process in all the stages. There are also some grow lights that have switches or dimmers in order to assist the plant correctly in all its grow stages. While looking for an LED grow light, make sure you look for the ones with angles of dispersion in them as the greater the angle, the more area that grow light will be able to cover. The lesser the angle will result in more direct light and less dispersion. One of the main factors before making any sort of purchase is how much are you willing to invest in it. You need to have an idea of how much you want to spend up front and on running costs. The LED grow lights can be comparatively expensive while at the time of purchase, however, you can save real money in the longer run as the LED grow lights have much much lower running costs when compared to others. These lights are pretty new to the markets when compared to other types of grow lights. 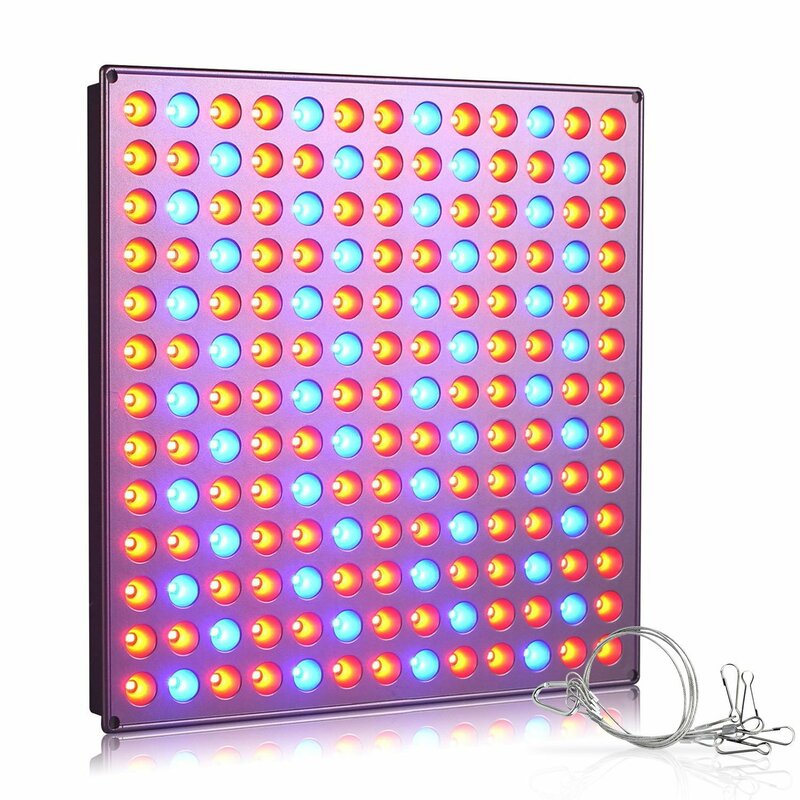 Not a lot of growers are very familiar with the full spectrum LED grow lights 2019 as they are relatively new systems in the market. A lot of people believe that an HPS and Metal Halide lamp or a giant fluorescent lamp are the best grow lights that can be used to grow your marijuana in an indoors setting. However, we are here to tell you that they are wrong. The full spectrum LED grow lights have a clear advantage over the others as they have the capability to mimic real sunlight which in return rewards the grower with higher yields. These lights are also known to increase flavour and potency and they cost far less over time. These type of grow lights are already cool and hence does not need any sort of a fan to keep them cool, they do not flicker like other lights and do not require a ballast. One of the most interesting things about the full spectrum LED lights are that their bulbs do not require replacing for at least 50,000 hours or more, that is easy growing for over two years. These grow lights have been deemed safer and above all, they are environmentally friendly. If you are already a grower and not using the full spectrum LED lights yet, consider updating your outdated system today. Choose from any of the options given below and you will witness the difference by your own eyes. Some handy tools that will be extremely crucial in helping you in the grow room. Yes, you read it right. You do need sunglasses for the grow room, well you do wear them outside, don’t you? In order to protect your eyes from the sun and the harmful UV rays that it emits, the full spectrum LED grow lights are also known for that. As they substitute the sun so effortlessly, they are so powerful that they also emit UV rays which is why whenever the light is on you have to wear sunglasses to protect your eyes. Even the plants need their food, just like human beings. A man’s body is affected by what he eats and the same thing goes for plants, they need their vegetables and minerals in order to flourish. These nutrients not only just affect the growth and yield, they also affect the flavour of the bud. So, if you do not want a poop-flavored weed, then make sure you pick out the nutrients for your plants wisely. Even if you are growing in a closet or any enclosed space, a grow tent is a good idea. It is extremely easy to control the climate within a grow tent for your marijuana plant. A grow tent allows you to protect yourself from their light when you are sleeping and also allows you to protect your plants from stray light sources when it is supposed to be dark for your marijuana plants. As a bonus, the grow tent will help you keep the humidity under control and it can keep control on smells as well. If you do not want to pick out every single item yourself, you can buy a ready-made toolkit for a grow room. Most of the time it comes with a grow room, but if you want you can buy it separately as well. You might think that only the advanced growers use light meters, but you can also use them and when you are advanced, you will know just how easy it is to use them. It is obvious that you need to keep track of the ambient conditions inside of your grow tent and a good hygrometer and a classic thermometer can do that job for you easily. We have selected the best out of the best for you which can last for years without any issues. There are a number of grow lights on the market. In order to make it more convenient for you, here we have selected the best LED grow lights 2019 depending on the results that they showed and the features that they have to offer. We have also considered some of the major other factors such as industry awards, customer reviews and a very close look at what our readers like and think are the best. Here we present you our top 10 recommendations for the best LED grow lights 2019. We have selected some amazing budget options as well. We have also selected some supplementary grow lights for flowering and a selection of grow lights for small spaces as well. Advanced has really outdone themselves after upgrading their already popular Platinum LED P Series with the diamond series. You can still go for the pLatinum series and that will be completely alright, but why go for that when you have much superior light in the Diamond series. Advanced has really gone and surpassed themselves here. We have noticed that the majority of the people like smaller lights up to 600W HID equivalents. That is why we have selected this based on the recommendations. However, if you want a bigger light than this, then do not worry because most of the lights we have selected are also available in larger models. Now, let us take a look at what makes the Diamond Series XML 350 so great that it tops our list. First and foremost, the absolute class of the LEDs themselves set this grow light apart from the rest. Single chip diodes, American made 10W CREE XML along with Bridgelux and whites. These LEDs alone are a major upgrade on the Platinum LEDs. these are super bright, top brand, reliable LEDs. The full spectrum Diamond Series now carries a 14 + wavelength spectrum which includes UV and IR in order to provide your marijuana plants with each and every kind of light that they need in order to provide you with big yields and potent, dense, flavorful buds because of the selection of its chips. 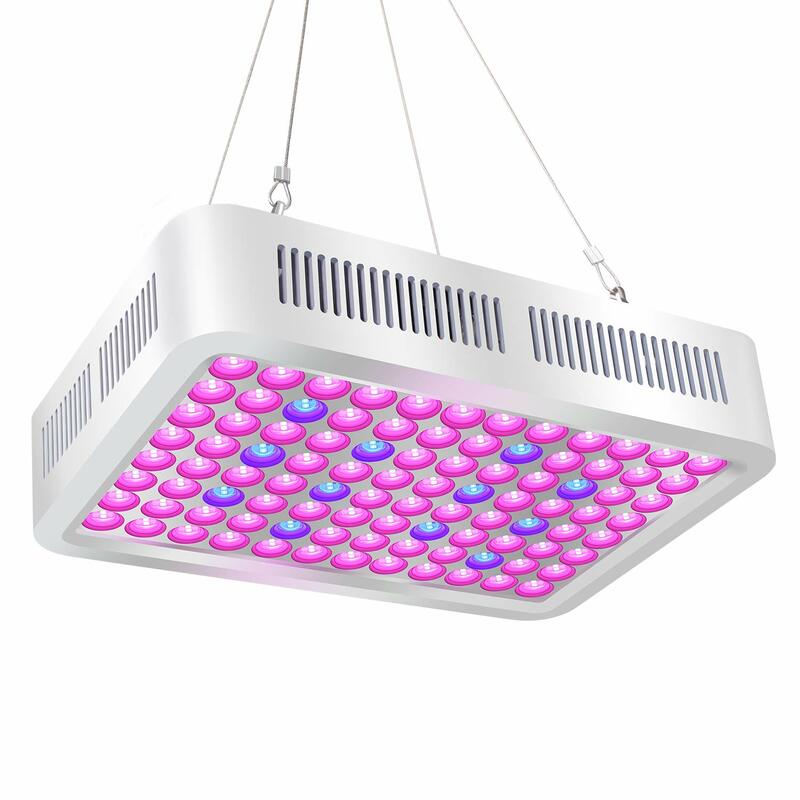 You will be able to use this grow light at every grow stage of your marijuana plant. More so, the Diamond Series XML 350 is capable of replacing a 600 to 800W HID light for an average draw of just around 330W. This means that this grow light emits over 50 less heat which means there is no need for a cooling system and you save a LOT of money by using far less electricity on your bills. Other features include a Daisy-Chain up to 4 units on one cord, veg, clone and flower modes with a dimmable color select switches. It also has really quiet fans, patented heat sinks, air flow vents and dust filter all of this in order to keep the LED light working for a longer period of time. It also comes with a 3 year warranty and a 90 day money back guarantee with hassle-free returns. It has a modular design which means you do not have to send the unit away for fixing when certain faults can be fixed on their own. Last but not the least, it comes with access to a 24/7 support staff and US sales. 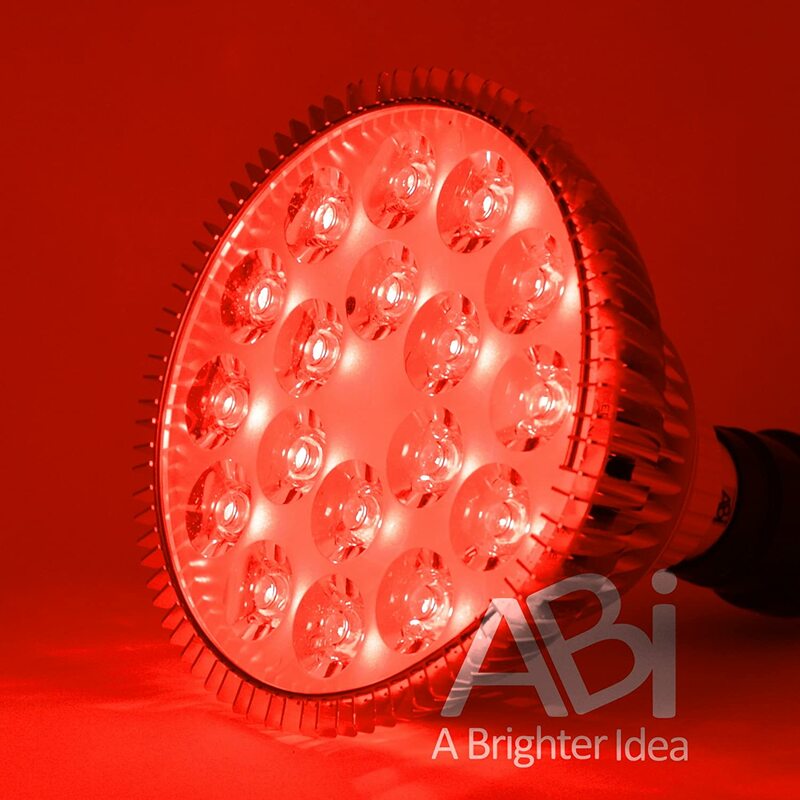 In terms of the coverage, the 10W CREE LEDs packs a precision 90 degree XML Collimator lenses which help this grow light achieve optimal coverage. This means that this unit can very easily cover a maximum grow space of 4.5’ x 4.5’ while covering the core at 4’ x 4’. 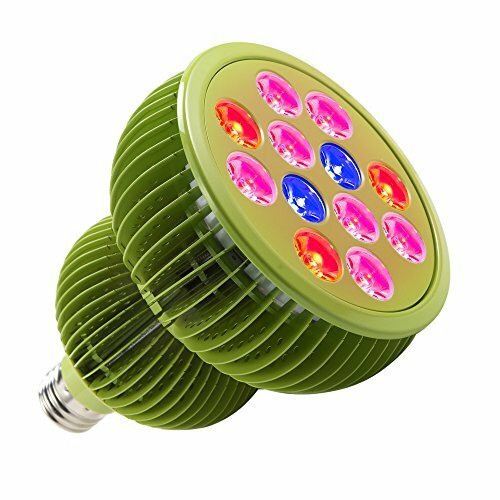 In terms of plants covered, this LED grow light can easily cover 16 to 20 marijuana plants in your indoor area. This amount of plants are usually more than enough for the regular and an average grower in most of the US States. If the Diamond Series XML 350 does not fit in your budget or the price that you are looking for then do not worry because the XML lights are flagship lights of Advanced, but the Diamond series, on the other hand, have a lot of other options to choose from within its range of price. The Diamond Series XTE are slightly cheaper lights which combine 5W CREEs and Osram LEDs. whereas, at the standard-entry level Diamond Series use only the Bridgelux LEDs. one thing that you will notice is that all of the above-mentioned substitutes which have different types of LEDs are all coming from the same trusted manufacturers and are American made. The VIPARSPECTRA Reflector V300 has the perfect balance of features of the price it comes in and it is one of the major reasons why it is so popular among the growers. 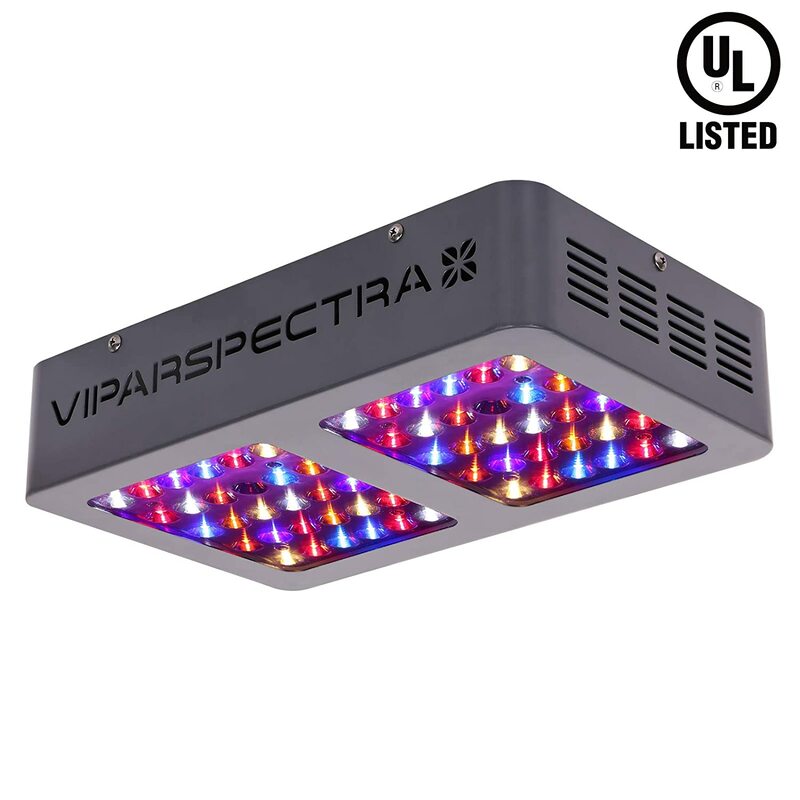 After examining it, we have come to the conclusion that these Viparspectra lights are so popular because of the fact that although these lights are affordable, they do not compromise too much with any of the features an LED grow light has to offer. 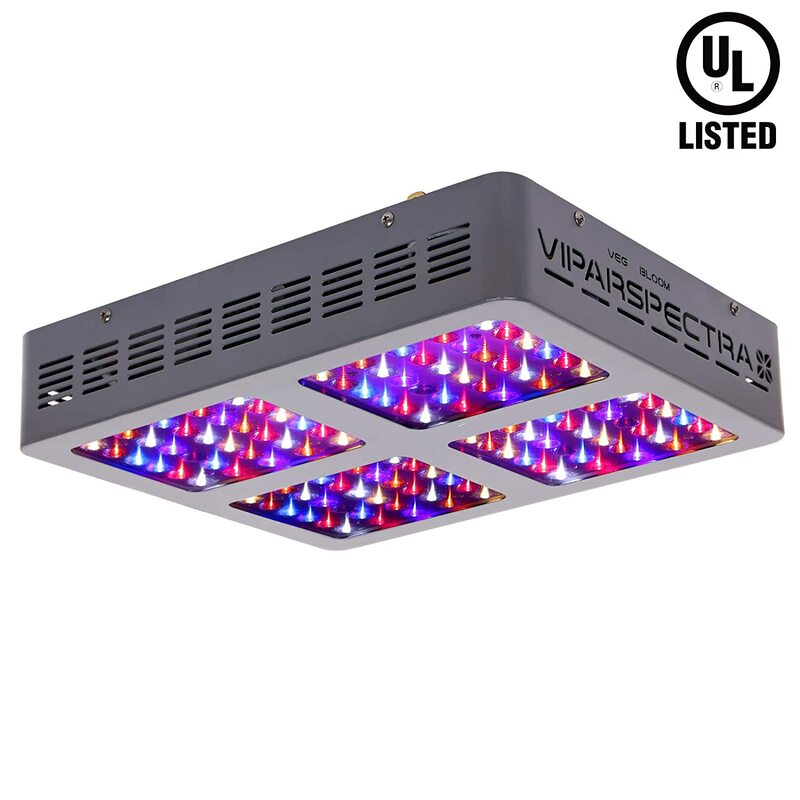 The company as a whole is doing something right as we have a total of 5 grow lights from Viparspectra alone in our top 10 list! 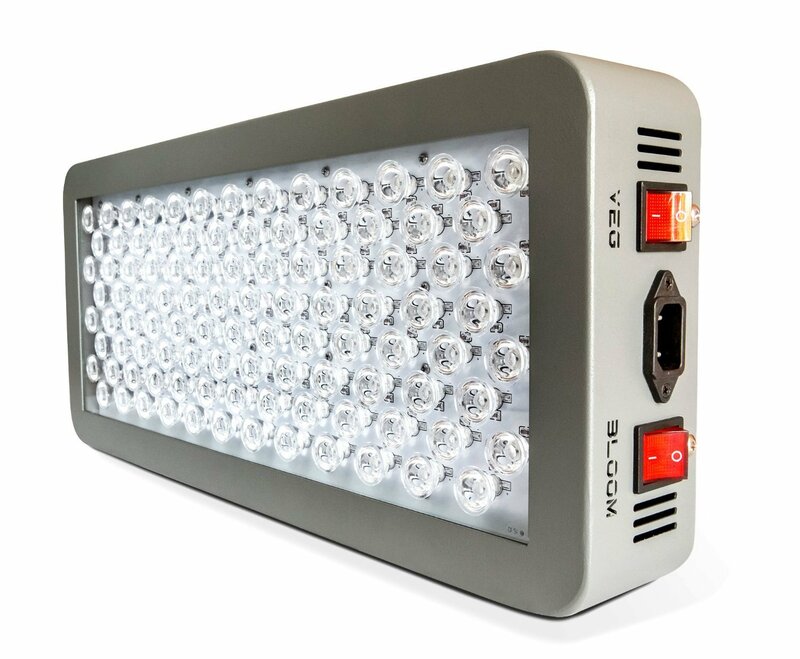 As for the V300, this is a full spectrum grow light with 12 wavelengths, including IR which is extremely affordable and can do the job of a 250W HID light while only working on 136W which is almost half the energy consumed. This makes it an energy efficient light. The LEDs are high-intensity 5W Epileds and Bridgelux chips, very good quality, and the LEDs have a lifespan of over a 100,000 hours. This LED grow light also has a 90-degree lens angle which is extremely helpful in covering a grow space of 1.5’ x 1.5’ hung at 18” and 2’ x 2’ when hung at 24” without any hotspots. When this LED grow light is hung at 24” the PAR is 300 at the center of the footprint. In other features, this LED light by Viparspectra offers a 3-year warranty, daisy chaining and a 30 day free trial period in which if you are not satisfied with the light then you can return it guarantee. You could have a look at the VT300 if you want a dimmable veg and bloom channels, a built in timer, slightly lower draw at the wall, an extra half-foot of coverage and a remote control to program your light. This one just costs a little bit extra than the V300, but if you want to have a bit of extra customizability in order to completely optimize your grow then you should have a look at it. The second biggest selling grow light from Viparspectra, the V600 can be called as the bigger sibling of the V300. it basically comes with all the same features but it also has the addition of a separate bloom and veg switches. The V600 from Viparspectra can replace a 600W HID light completely while consuming less than half energy at 269W on average which means it is extremely energy efficient. This LED grow light 2019 is able to cover a grow area of 2.5’ x 2.5’ when hung at 22” and 3’ x 3’ when hung at 32”. At the center of this LED light footprint, the PAR is at 784 when hung at 18”, 530 when hung at 24” and 275 when hung at 36”. If you are looking for the built in timer, remote control programmability and even better coverage in the same model then check out the bar shaped VT600, again, it is a little more expensive but it also offers more features. You can also check out the VT600-S, as it has the same shape as V600, offers the same coverage as the V600 but it has the best PAR values when compared to V600 and VT600. According to its size, you can call the V450 from Viparspectra a middle child. Anyways, the third consecutive grow light from the same company in our top 10, the Viparspectra V450 can easily replace a 400W HID light while drawing only 200W which is exactly half the energy a 400W HID grow light would consume which means half the electricity bill, this makes this grow light a very cost effective light in terms of energy efficiency. 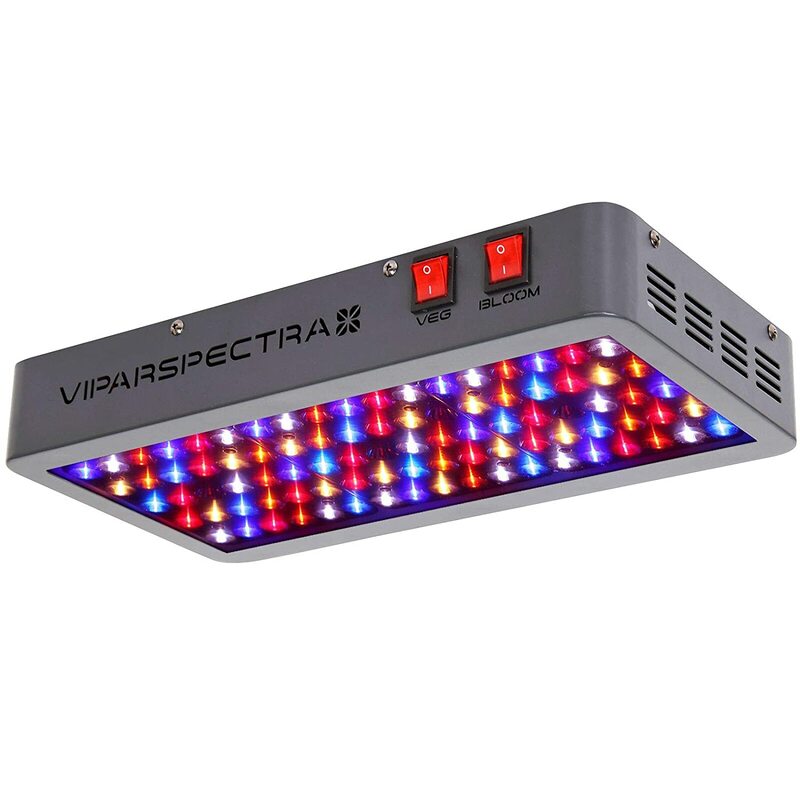 This LED grow light from Viparspectra will give you a coverage of 2’ x 2’ when hung at 18” and 2.5’ x 2.5’ when hung at 24”. The PAR value at 18” is 415 and 655 at 24”. It also has a separate bloom and veg switches and this version also has an upgrade in the form of the VT450 which offers a more marrow and longer light which provides a coverage of the grow area of 2’ x 2’ when hung at 20” and 3.5’ x 2.5’ when hung at 28” and PAR of 396 when hung at 24”. In the recent times we think that the PlatinumLED’s Platinum Series of LED grow lights has been far surpassed by the Advanced LEDs Diamond Series which we have covered above in the article. However, the Platinums still remains one of the better brand of grow lights in the market and have been consistently popular with the growers and are available widely. That is the reason we are happily including them in our top 10 list as well. Even though the Diamond Series might have just edged past the Platinum Series, we still think that the PlatinumLED is an established, reliable company who makes top end grow lights that can be trusted and used. The company has been known to always use top quality components and assemble the light in the United States. However, with the Diamond Series, Advanced has just taken the overall quality of the components to a whole different level of great. Just like the Advanced LEDs, these grow lights are not cheap, however, with extra reliability and extra quality makes these grow lights worth every single penny. The Platinum Series grow lights are more than likely to be cheaper than the Diamond Series grow lights. So, if you feel like you can not afford the Diamond Series grow light, these Platinum Series P900, P600 and the P300 are here to solve your budget problems. Every single one of the grow lights in the Platinum Series are using the revolutionary technology of full spectrum in order to meet all the needs of light for your plants and keep the plants and your grow room relatively cool. This grow light from PlatinumLED offers the trademark three times the brightness when compared to many other competing LED grow lights 2019 in the market. The P900 from the Platinum Series has 12 bands of light wavelengths which include the ultraviolet and the infrared which you can not see with your naked eyes. This LED grow light and the other grow lights in the Platinum Series is the closest you can get to having a sun inside your grow room. wThis grow light also comes good when needed in every stage of growing marijuana indoors. The P900 also comes with the feature of switching between different light modes in order to accommodate your weed to grow properly. For sprouting, you can hit the “Veg” switch and keep it low key and you can also kick the intensity up a notch by switching to “Bloom”. In order to encourage massive growth in your plants, the 90 degree angle of the LED lense which is focusing will send the light directly into the canopy of your plants. This LED grow light can easily do the job of a 1000 watt HPS light at full intensity and still use only half of the electricity at 515 watt which makes this an extremely efficient in terms of saving as much as possible on energy costs. If you suspend the P900 18 inches above the plants its core coverage will be up to 3’ x 5’ and its maximum coverage is recorded at 4’ x 6’. You can very easily adjust the height of this grow light in order to accommodate the plant and provide it with necessary light according to its grow stage. In the early stages of sprouting, you can easily cover up to 4 by 6 but in the latter stages such as flowring you will have to provide more intense light to your plants. This LED grow light can comfortably provide perfect lighting for 12 to a maximum of 24 plants at a time. This LED grow light is not a budget light but the fact that the P1200 LED drivers can work anywhere in the world as they accept voltage from 85V all the way up to 260V. 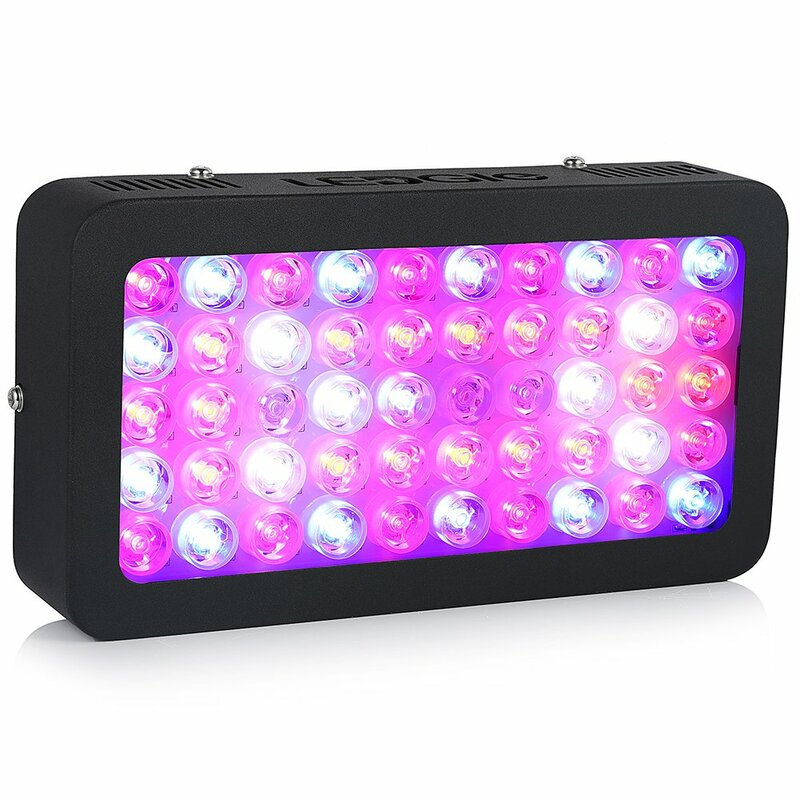 The grow lights from Platinum has one of the best deal in warrant to offer in the market. They offer a 90 day trial period in which you can return the light for a full refund if you don’t like it and the grow light comes with a massive 5 year warranty. The Platinum Series P600 is one of the most advanced grow lights in the market as of 2019. This grow light might have a premium price tag but most of the growers agree that the premium light justifies its premium price tag. This is one of the best LED grow lights you can buy in the market if you have the money to invest in your crops. The Platinum Series P600 is very easy to set up and the build is sturdy. The core coverage area for this LED grow light is about 2 feet by 5 feet which means when you hit the Bloom button, it will be capable of providing light to a maximum number of 10 plants. In order to make sure that your plants do not burn because of the intense light that the Platinum Series grow lights have to offer, they have powerful fans installed in the grow lights. The light that is emitted is so intense that you can actually physically see the light penetrate the plants which is a pretty impressive feat. this grow light comes with an undisputed 5 year warranty and customer service directly from the company itself. With the amount of energy this grow light will save while doing the job of a 800W HPS alone, this will easily pay for itself within the warranty period. The Platinum Series P300 is the perfect runner-up for the people who love the P600 however, they do not have a quiet a large grow tent or the budget to buy it. The P300 is definitely one of the most affordable LED grow lights 2019 in the market and it offers almost all the features the P600 has to offer on a smaller scale and at almost half the price of the P600. The Platinum Series P300 covers an area of about 4.5 feet by 3.8 feet while installing at an height of 18 inches. This space is perfect for the compact grow areas or even when it is being used in combination along with more lamps in order to cover more area. The Platinum Series P300 can easily replace a 400-watt HPS grow light while just consuming 180 watts of power which is actually less than half of what you would have to pay in electricity bills. This makes it an extremely energy efficient grow light which can help save more than half of your money on light bills alone. This grow light is just perfect for a small home grower. Similar to the P600 which covers the higher end of the market, this is still a very serious piece of equipment which is an extraordinary steal for the coverage it provides. This system is one of those which gives out great PAR output values. If you do not know what that means then it is the panel which gives off twice or even thrice the times of intensity that other grow lights has to offer. More importantly, this system has a spectrum which consists of 11 bands which provide your cannabis plants the most possible nutritional value which include those that are needed from UV and IR. all the light chips are 3W LEDs, and as mentioned before, the very best of the 3W panels consist of an additional lens in order to focus the light even more. Thi panel right here packs a 60-degree lens and a 90-degree secondary focusing lens in order to give higher intensity for plant growth. All the chips on the lamp are replaceable which is another reason for the higher price tag. This means that you can continue to have a 400 Watt output even when one of the chips blows up. All you need to do is order the one chip and simply replace it whenever it arrives from the manufacturer. Advanced LED offers amazing security to the customers with 5 years worth of warranty. Rounding up the top 5 sellers is the MarsHydro with a 300W to offer. MarsHydro has been in the business for eight years and have a growing reputation. The MarsHydro 300W is one of the most basic, entry level full spectrum light by the company but it is an amazing budget option. First and foremost, the high-intensity Epistar 5W LEDs are actually better than what you will find in the market for the similar price range. Then there is the coverage which is 2’ X 2’ which is respectable as it can very easily cover at least two big plants. The power draw of this grow light is only 132W which is less than half the amount of Watts that it offers which means you will save more than 50 on your electricity bills with this grow light. There are plenty of both, the red and the blue wavelengths in its spectrum which allows it to be suitable for the whole grow. Even though these grow lights are manufactured in China, there is a service center in California and there are numerous warehouses all over the US and Europe as well to ensure quick shipping. As it is a budget grow light option, there are going to be some downsides to it as well, such as it does not have any IR or UV wavelengths in its spectrum, there are no dimmers or switches to toggle between veg/bloom and last one is that the hangers is not adjustable, however, you can buy an adjustable hanger online. 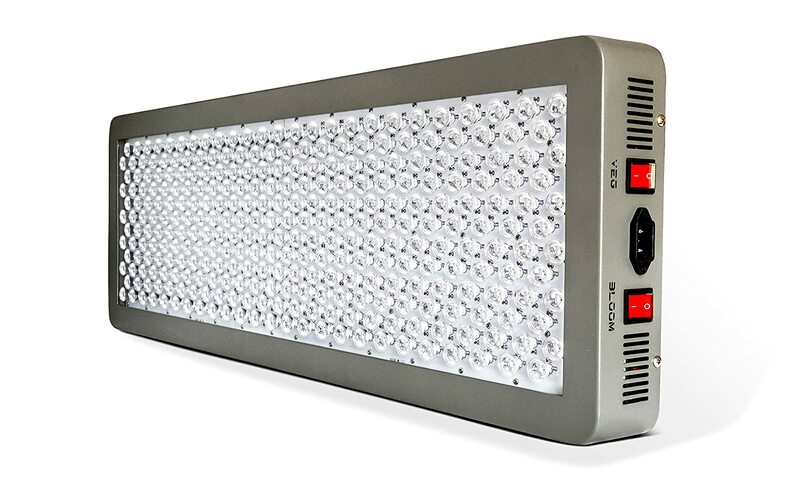 This grow light is still a very popular light among those looking for a budget grow light, however, if you are looking for more coverage, brighter and want separate veg and bloom switches, then have a look at the MarsHydro’s latest models in the Reflector Series or even the Pro II Series and they will still be relatively affordable when compared to what other grow lights which are offering similar attributes. This grow light is a much better fit for a small square 4’ X 4’ grow tent that a lot of the rectangular grow lights that we have covered. 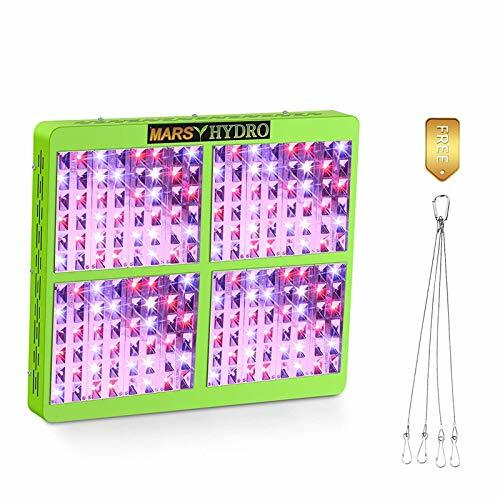 There are two settings on the MarsHydro Reflector 960 Watt LED grow light that are the flower setting and the veg setting. This grow light is a popular back up for the growers but if you compare it with the lights that are less expensive, this one comes out on top. This can be considered as an outsider in the top 10 list but is solely on the list because of the popularity it has among the growers as an amazing backup light to have. The DomGrow’s G8LED 600W MEGA LED Grow Light is absolutely worth the price that you have to pay in order to acquire the great quality you get with this grow light. The High Times Magazine actually named different versions of this grow light as the winner in 2014 and 2016 STASH Awards and even got the Best LED in 2017 for its bloom-only version. This grow light is going to be there for the entirety of the grow cycle of your weed as it has 8-band wavelength and UV pus IR which will make sure that your weed is tasty and potent. As far as coverage goes, you will get to cover 4’ X 5’ in both the veg and flowering stages with the penetration of 5’. That means that this grow light can easily replace an 800W to 1000W while consuming just 380W which means that over a short period of time you will be able to recover its cost via the savings you get on electricity bills alone. In order to get maximum yields, DormGrowhas suggested that you add a couple of the 90W all red bulbs when the plants are at the flowering stage. The company claims that while you run the grow light at full intensity and capacity, if you add some extra red wavelengths when the plants are at the flowering stage will result in a more effective and economical method of using the LED technology to its fullest in comparison to the normal approach where you use a single light and some of the red wavelengths are turned off or dimmed at the veg period. Evidently, High Times agree! The lights will stay cool enough that you can actually touch them even though they might have been running for over 24 hours. The company offers a two year warranty period over this grow light which will be entirely serviced by them and from time to time, they even reach out to their customers to make sure everything is going well. Here is another grow light manufacturer who has had the honor of winning the High Times STASH award more than one time. Kind LED won the “Best LED Innovation” for its amazing GH Series of supplemental bar lights in 2016. 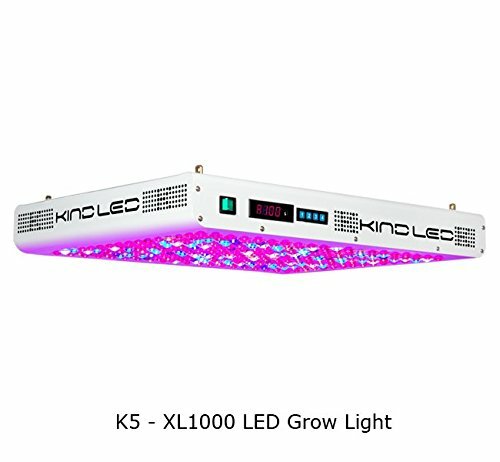 After that, last year, the company got the same award one more time but this time it was for this beast of a grow light, the Kind LED K5 XL 1000. This grow light can easily replace a true 1000 Watt HID. the Kind LED K5 XL 1000 can cover a footprint of 5’ X 5’ while drawing just 630 Watt which is almost half. This will make sure that you get outstanding yeild and bud quality per watt and significant savins in the electricity bills. As you would expect from a grow light of this caliber, it runs very cool even without external cooling in the grow room and even without the noisy internal fans. However, the major part of the innovation comes in the form of a completely programmable and customizable 12 band spectrum as well as the in-built timer. When the company says “fully customizable” it means fully customizable. You can very easily exactly copy the seasons and the sun’s passage through the sky during the day. This is possible because the XL 1000 are truly dimmable. The grow light will slowly “rise” and intensify and slowly “set” as well. You can also optimize this grow light according to different stems of marijuana as well. All of the customizations can be easily set up and controlled with the help of a small remote controller. As a matter of fact, you will be able to control up to 100 lights with this one little remote controller. The company offers you a 90-day trial option where if you are not satisfied with the grow light you can return it for cash back. It also provides a lifetime of free customer support with the grow light. 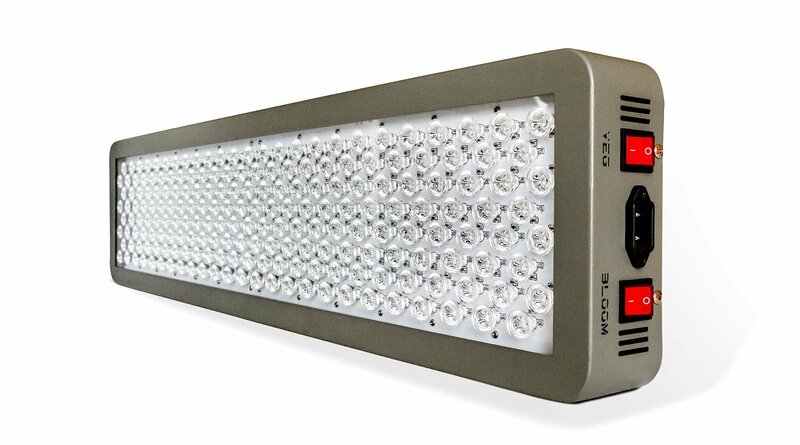 If you are looking for more positives, the XL 1000 is actually the only LED grow light available that is listed on UL which means that it does meet some pretty high safety standards. If you are looking for a grow light this powerful, then this is actually the gold standard LED grow light in the market and is the perfect fit for you. Some of the lights mentioned below are no-frills, however, they are bright and actually do the job, while some of the others pack a lot of features in relatively small price tags. The situation with the budget options is that there will always be a trade-off in some areas, however, we have formed a list of grow lights which strikes the best balance between the features and actually doing at the very least one important thing brilliantly. Even though this grow light is comparatively inexpensive full spectrum grow light, it has got a lot of value for money and it is also one of the top best sellers among grow lights. First and foremost, this grow light has huge LEDs! There are 50 of these huge LEDs and they are all 6 watts each. This makes this grow light emit extremely intense bright light which is very good and works excellently for dense pants. This grow light can easily cover 2 feet X 1.5 feet when the plants are at their flowering stage. The best thing about this grow light is that the customization options are identical to those on the more expensive grow lights that we covered earlier. The options cover two switches, one of the switches is for the veg state and the other switch is for the flowering state. This grow light spectrum manages to cover 11 bands. The 11 bands include IR, white light and UV as well. The two fans which are in the grow light have back up system in order to keep them running even if one of their chips manages to fail. Global Stars offer you a one year warranty with the grow light and the warranty includes service and parts as well. This is another one of the grow lights that is very popular among the growers. The GalaxyHydro 300 Watt is among the least expensive grow lights that we have reviewed. This grow light is a nine-band spectrum grow light with a ratio of seven to one of red to blue LEDs. it also has IR and UV. this grow light can cover 2’ X 3’ at most so it is only recommended for sprouting purposes and not for the flowering purposes. This grow light is made to be daisy chained. You will be able to buy two or three of this grow light and will be able to link them together if you require it to cover larger space at the cost of less than the bigger grow lights. 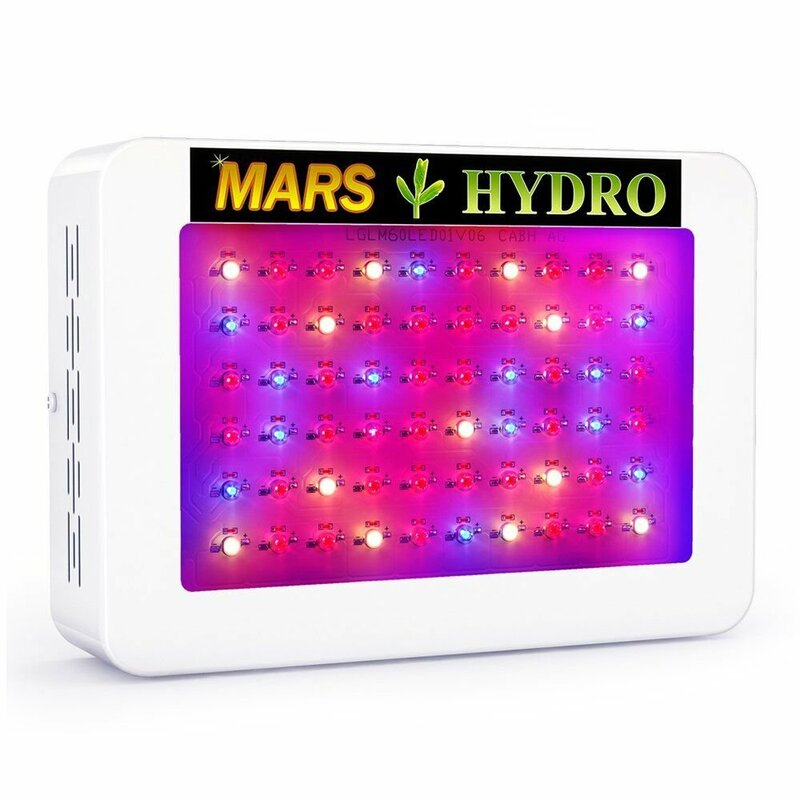 GalaxyHydro offers a two-year warranty with the purchase of this grow light along with a 30-day money back guarantee which means you will be able to test it for a month and if you are not satisfied with this grow light, you will be able to claim your money back that you spent for it. This grow light is actually capable of going head to head with the likes of Mars Hydro and VIPARSPECTRA in terms of quality. 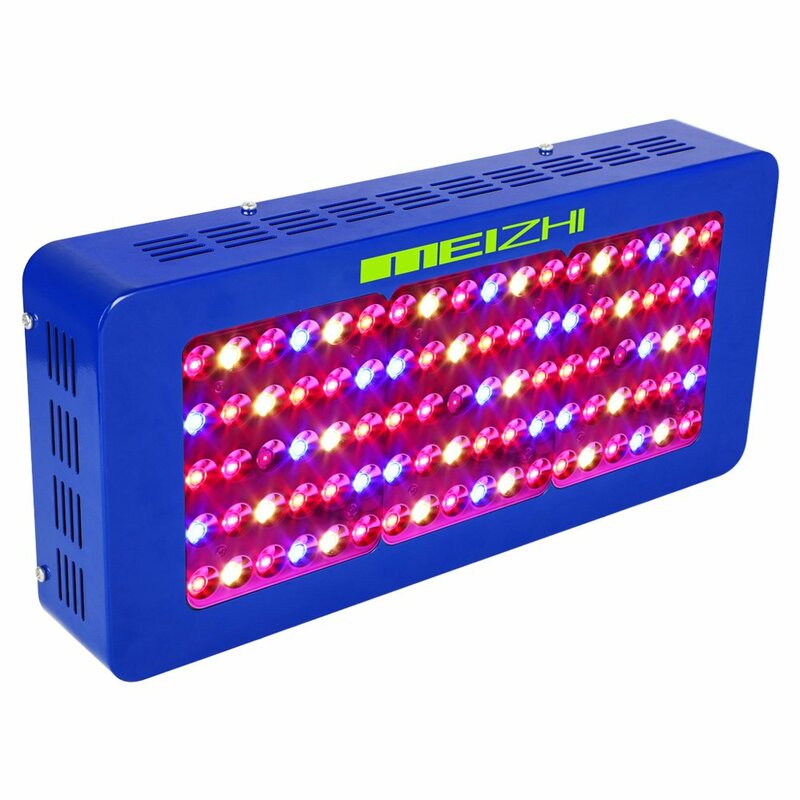 The PAR rating of MEIZHI Reflector Series R450 450W LED Grow Light is 779 umol, which is absolutely amazing for a grow light with this price tag. This grow light consist of ninety LED bulbs which are 5 watt each and this grow light covers the complete spectrum that is required for healthy big buds in your next harvest. This grow light can easily replace a 450 Watt HID lamp while consuming just 195 Watt which will save your enormous amount of money on electricity bills. This grow light also have the options for customization. Turn the switch to ‘Grow’ in order to provide your plants in their veg stage and turn the switch to ‘Bloom’ in order to provide your plants for their flowering stage. This grow light also have 120-degree reflectors, with which the panel is able to cover 3.5 feet by 2 feet of space easily by itself. You also have the option of Daisy chaining it for larger grow tents. If you are looking for a larger version then you are in luck because the company also has a 600 Watt version of the same series. Some of the growers prefer to have a single grow light running continuously at full intensity and add some red lights in order to support their plants at the flowering stage of their grow cycle. If you like to grow your plants in the same way, then we have some supplemental bloom lights reviewed and listed below. In this section, the people who want to buy a grow light for very small space for only one or two plants or if you just want to try out something small scale or something low in cost for your first shot at growing weed will find that we have some amazing options for them in this section that are specifically good for small grow spaces. This is the perfect grow light for the people who are looking to do a brand new growing operation and are willing to start on something small scale. If you are looking to grow a single plant, then why would you want to spend hundreds of dollars behind grow lights that are capable of growing many more, right? This grow light is absolutely perfect for you if you wish to master your growing skills without investing a large amount of money initially. The TaoTronics Hydroponic 36 Watt LED Grow Light TT-GL23 might not last for your long-term goals but it is quite difficult in order to find a grow light that is available in the market for a better value. The TaoTronics Hydroponic 36 Watt LED Grow Light TT-GL23 will fit a standard E26 socket, it lasts up to 50,000 hours and only consumes 220 Watt worth of electricity. This grow light is the latest and the brightest in the TaoTronics LED grow bulb line and it also has a 60-degree beam angle which allows it to give you better coverage. Even if you are looking to grow just a single plant, we would recommend you to use two bulbs in order to receive the best results. Here is another one of the grow lights that have been very popular with the growers. The Roleadro 45 Watt Panel LED Grow Light can be recommended more for seedlings because these grow lights are not that powerful enough in order to provide for any marijuana plant older than a couple of weeks. However, if you plan on having or already have a separate germination area then these low costs grow lights can come real handy. These grow lights are also used for supplemental lighting. 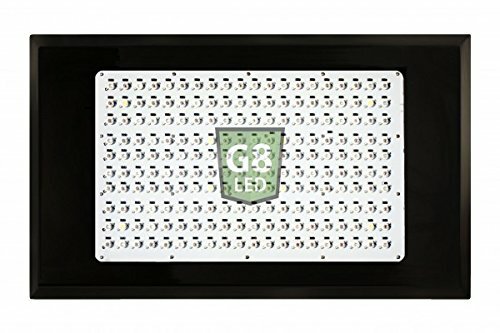 This company is one of the best manufacturers of indoor growing equipment and LED grow lights and this option of a small LED grow panel is a really good option for the people who are new and are looking to grow small plants. This grow light by Apollo only consumes 90 Watt of electricity and covers a space of about 2 foot by 2 foot in which you can easily grow three plants. This lamp does not require ballast and is very easy to hang as it is lightweight. 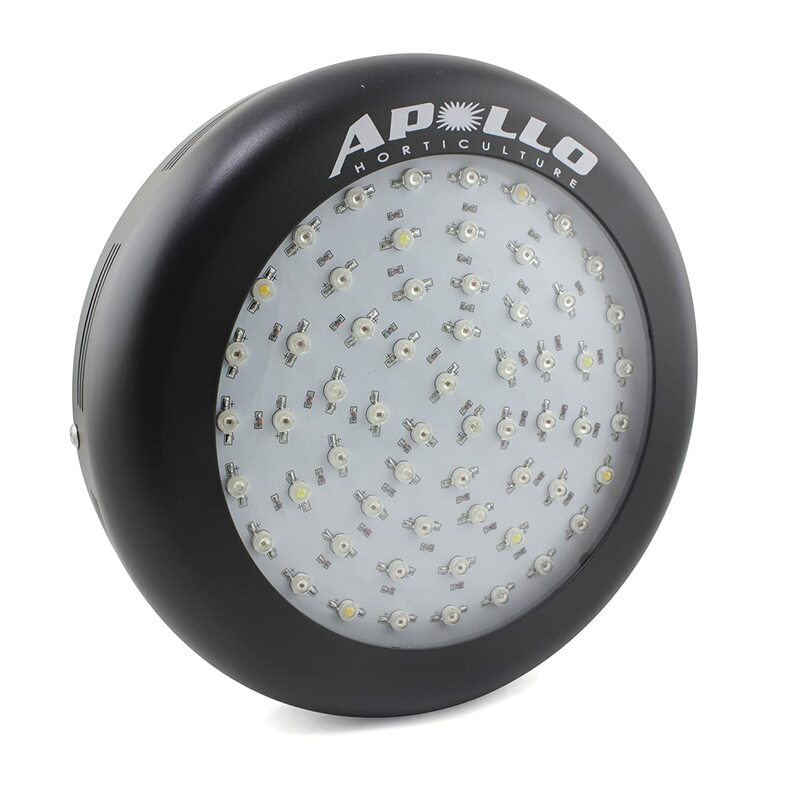 One of the best features about the lamps from the company Apollo is that you are able to hang the lamps closer to the plants than other company’s lamps because these lamps from Apollo are really cool. As a matter of fact, this is the perfect lamp for marijuana seedlings because it is able to cover four important wavelengths of the spectrum. Even though this lamp is very small, the lifespan of this lamp is over 50,000 hours and in addition to that, the company also offers a warranty of two years which is not usual for an inexpensively priced lamp. This lamp will be able to work with all the phases of growth which includes the flowering stage, although it is recommended that you add a second lamp for the flowering stage of the growth phase. Let us assume that you are in a situation where you want a bigger yield but you are already stretching the light from your LED panel to its extreme limits. Many of the growers supplement their already existing LED panel with one or more extra red lights. The extra red lights encourage better blooming. Since they are also LED lamps, they tend to last for years. This makes them a very cheap investment. This lamp can do a job of a 56 watt consuming HID light and only draws 26 watt which is almost half. This way this light is already paying you back in electricity bills. This bulb from ABI is an extremely inexpensive way to get more flowers and buds on your marijuana plants. It can easily fit into a standard household lamp socket or you also have the option of plugging it in an extension cord which is made for light bulbs. You do not need to worry about heat with this lamp because it is not hot like an incandescent red lamp, it will run very cool. This grow light is the perfect ally to the G8LED grow light that is listed above. All you need to do is add one of these at a distance of 10 square feet in the grow area when the marijuana plants are in their flowering stage in order to gain oer raisin, higher yields and bigger, denser buds. These grow lights are capable of doing the job of a 90 watt HID bulb at the rate of 75 watt which means there is an easy return on investment right from the electricity bills. 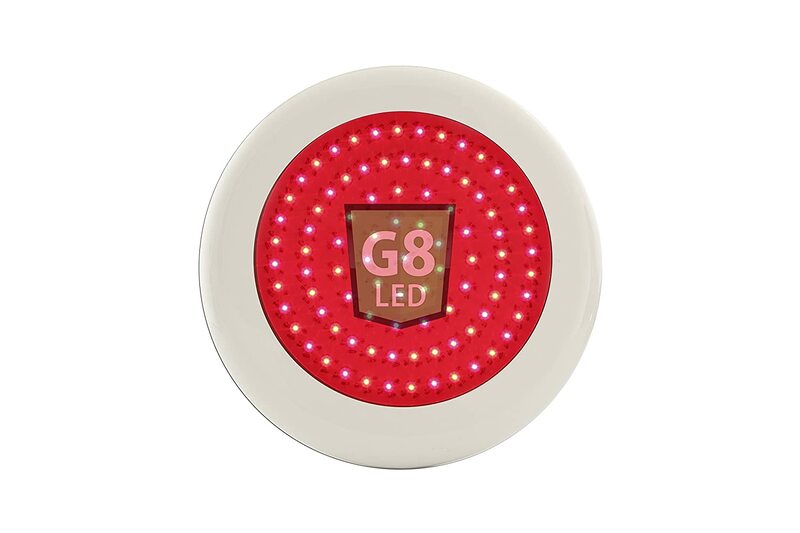 The G8LED 90 Watt All Red Flowering Boost LED Grow Lights will also work fantastically well with with other full cycle, full spectrum grow lights that are without an extra bloom setting. Here is the last grow light that we are going to review on here. This grow light would definitely have made it into the top 10 for last year and even though it was unable to make it into the top 10 for this year, this grow light is too good to be left out completely. This grow light is one of the more expensive grow lights on our list and this was one of the reason with another one being that its popularity among the growers have slightly decreased. However, we still would very much like to recommend the California Lightworks SolarStorm 440 Watt LED Grow Light to you because in this case you will actually get the quality of product that you pay for. Adding to that, you might be able to get this grow light for a bargain price since the manufacturing of the California Lightworks SolarStorm 440 Watt LED Grow Light has been discontinued and it has been replaced by the Solar System 550. The discontinuation of the grow light was another one of the reasons why it did not make the cut for the top 10 list for the year 2019. However, the California Lightworks SolarStorm 440 Watt LED Grow Light still remains pretty widely available as of now. This is the reason why we will be keeping the review for the time being. The California Lightworks SolarStorm 440 Watt LED Grow Light can very easily do the job of a 600 Watt HPS light while just consuming 235 Watt which means you will be saving more than half on the electricity bills from day one. This grow light consumes 235 watts during the vegetative state, 320 Watts in the bloom state and 350 Watts during the final few weeks of the grow when the UV-B booster is turned on. This grow light can cover 3’ X 3’ for bloom and it can cover up to 6’ X 6’ during the veg stage. 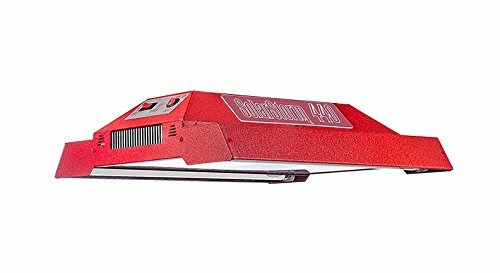 One of the most distinguishing factor about the California Lightworks SolarStorm 440 Watt LED Grow Light is that the unit is painted with a bright red color which is very different from the subtle colors used by other manufacturers. However, this is not the only thing about this grow light that is more notable. This grow light is more intense when compared to the lights that use 3 Watt chips because this grow light uses 5 watt OSRAM SSL LEDs and this light has 88 of these chips in its panel. All the optics are jewel quality glass that are focused at 90 degrees. In addition to al this, this grow light also has two T8 15 watt UV-B tubes in order to enhance the growth of the plants when they are in their flowering stage. This is a very unique feature that you will not find in many grow lights. In order to prevent from heating, this panel runs very cool and without any noise with the help of its inbuilt fans. In order to protect your investment, the company offers a 3 year warranty period. Welcome to the section of our FAQ about LED grow lights. This is going to be very helpful for you if you are new to growing weed or if you just want to clear some basics. Let us start from a little introduction about the LED grow lights. LED: stands for “Light Emitting Diode”. Grow: this helps the plants in order to grow in the best possible way when they have been planted indoors. Light: this will provide the energy that the plants would receive from sunlight if they were planted outdoors. 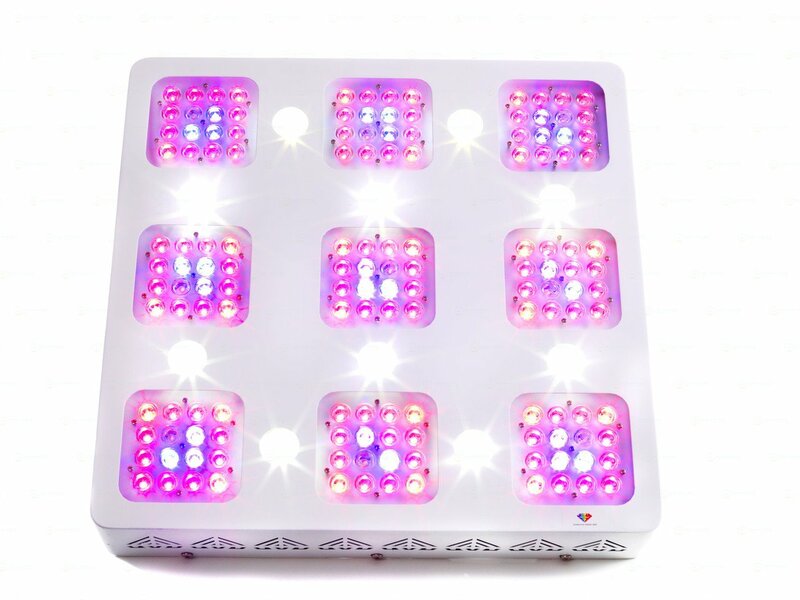 The LED grow light includes different wavelength of different lights including visible and invisible which includes IR and UV rays which can directly increase the growth of your weed and ultimately it will result in more yield of any plant that has been grown under these lights. You must be wondering that how can these small lights help your plants grow better even without the sunlight? Plants are known to have a tendency for absorbing more blue light than other lights such as green or white, this makes the UV rays the best ones in order to induce vigorous growth in the plants. The infrared rays are known to be the best catalysts for blooming and germination boost. The wavelengths in the grow lights are adjustable according to the requirements of your marijuana plants in the grow room. When you have your marijuana plants inn their vegetative phase, using the UV rays will help increase the cell division as the marijuana plants absorb the rays. Because of the increase in the cell division, the marijuana plants will grow much faster and it will result in more yield. If your marijuana plants are in their flowering phase and you want to treat them, some of the most effective LED lights are the ones which provide infrared rays, or IR. the infrared rays, or IR are readily absorbed by the apex and the buds of the marijuana plants and this process causes them to bloom very heavily and quickly. It is recommended that you go for the LED grow light which has a wide range of wavelength options available for you to have the ability to make the most of it in all the grow stages of your marijuana plants. By this feature, you will be able to adjust the effects of the grow light according to your needs. The type of light emitted, Lumen per area, amount of light, the height between the light and the plants, types of plants being grown and wavelength can all affect the growth of the plant that is being treated. Before there were LEd lights, there were other similar methods that were used in order to grow indoor plants. The methods included fluorescent bulbs and high pressure sodium lamps. Those kind of methods were not favourable at all for the small grow room owners who wanted to have a compact, small structure. Those lights needed a lot of room in order to set up all the equipment and since they produced huge amounts of heat, they needed a proper ventilation system in order to avoid building up of the heat in the grow room and burning the plants. All of these complications made sure that this process was out of reach for the small grow room owners. The best thing about the LED lights is that they do not take up a lot of space, they do not contribute to extra heat, they do not need their bulbs replaced, they use half the electricity to run and they do not have ballasts to manage. The LED lights come in an extremely compact structure that is very easy to handle. You do not require any specific knowledge in order to install LED lights to your system. All you need is a proper place in order to hang the LED lights above the plants far enough to appease the distance required between the plants and the LED light. The reason that LED lights do not need a separate ventilation system is because they do not emit a lot of heat to begin with. These LED lights are able to work without any help from any sort of a huge ventilation system helping them keeping cool. As we mentioned earlier, the LED lights have a very compact design and in addition to that, most of the LED lights allow you to install them right next to each other which in return provide you with more coverage. It is very easy to control the wavelengths on the LED lights and in addition to that, you can also choose between the modes for blooming or the vegetative phase of the plant. All of the factors mentioned above makes the LED lights much more favourable and give us great results with a lot less cost and hassle. When it comes to the LED lights, you do not actually need to worry about the wattage. First of all, you need to understand that wattage is, it is not a measure of intensity or brightness. It is just the measurement of how much power is being consumed at the wall. In some cases such as when you compare two different bulbs with different wattage but have the exact same technology, then the one with the higher wattage will be the brighter bulb. However, in the case of LED lights, they are considered to be much more efficient than the HID lights, so if an LED light is drawing the same power as an HID bulb, then the LED light will generally be much brighter. What complicates things much further is that there are many different LED technologies competing with each other and there are secondary optics which can be used in order to intensify the brightness even more. How To Know If Your Plants Are Going To Get Enough Light? First of all, it depends on the type of strain that you are growing. Different types of strains have the different type of light requirements. This is why we highly recommend that you first pick a strain to grow and then start looking at the LED grow lights. As you decide on which strain you want to grow, you will know how much light it needs, all you have to do now is just compare the amount of light needed for your chosen strain with the coverage charts and PAR values which are provided by all the manufacturers of LED grow lights. A good and reputable manufacturer will always give you enough information about their LED grow lights as to how much grow area it can cover and at what heights it needs to be put for maximum productivity. They will also let you know about the PAR values across the whole footprint. Obviously, you will be needing an LED grow light which will be able to supply as much PAR as your chose strain needs to grow and if you want maximum yields, the more PAR you provide the better your plants will grow. The term PAR (Photosynthetically Active Radiation) refers to the wavelengths of light which can actually be used by the plants to photosynthesize. The more of these wavelengths of light that your marijuana plants receive the better. In general, the PAR values are measured in two ways, those are, PPF and PPFD. PPF or Photosynthetic Photon Flux calculates the amount of usable lights that are being emitted by the grow light. The Photosynthetic Photon Flux is measured in micromoles per second (μmol/s). The term PPFD stands for Photosynthetic Flux Density. The Photosynthetic Flux Density is an even more important measure because it not only specifies the amount of PAR that is emitted by the LED grow light but it also tells how much of that light is actually falling on your cannabis plant. The Photosynthetic Flux Density is measured in micromoles per square meter per second (μmol/m²/s). There are some manufacturers that will only provide you with the PPF values and some will only provide you with measures that only indicate from right in the center of the light’s footprint. Both of these tactics allow sub-standard manufacturers in order to make inflated claims about their LED grow lights by only stating the PAR values of the grow light very selectively. So, you need to make sure that you are getting what you need, in order to do that, you should always check the diagrams of the PAR values across the whole footprints and even at different heights as well. We do hope that you enjoyed this massive guide for buyers for the best LED grow lights in 2019 for your marijuana plants. We wish you the best of luck in growing marijuana independently and hoped that we could help with this informative article. Happy growing!